At first glance this ‘new’ Sorento may appear to be a mildly revised version of the outstanding car but it only shares a handful of its body panels. Most of the changes have taken place under the skin as the new Sorento sits on an all-new platform shared with its Santé Fe cousin. 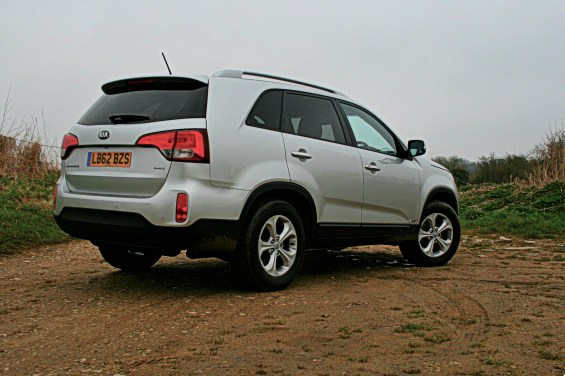 The previous Sorento was hugely practical and rugged if a little dull and cumbersome to drive. The new model promises to change this. Does it succeed? Inside revisions are equally mild amounting to a new centre console, dials and improved materials throughout. The switchgear is much easier on the eye than before, with plenty of metallic highlights. Although the appearance is still some way off high quality, it’s definitely an improvement. It may be better than before – which wasn’t difficult – but it is still far too hard to the touch. Thanks to the new platform interior space is improved by quite a margin across the rear bench and to rearmost seats. 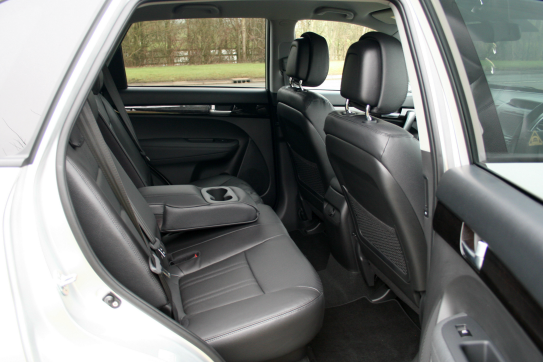 Space was already generous, so is now ample, helped by a cavernous boot that still offers a fair amount of stowage space even with all seven seats in use. It’s also easy to find a comfortable driving position thanks to plenty of seat and wheel adjustment and good all round visibility for the driver. Equipment levels are also better than before, our mid-spec KX-2 comes with standard fit dual zone climate control, sat nav, reversing camera, automatic lights and wipers, heated leather seats and alloy wheels. It also has an array of safety kit and that coveted five star Euro NCAP crash rating. 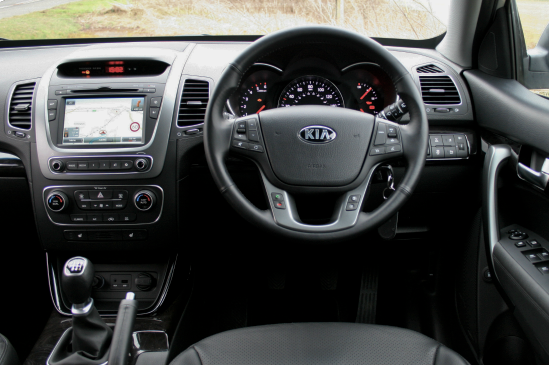 As soon as you set off the new Sorento feels vastly different from before. Thanks to new suspension subframes, longer rear trailing arms and the use of more lightweight metals it instantly feels lighter on its toes than before managing to hide its bulk well. Its ride has also improved noticeably thanks in part to the smaller wheels fitted across the range. It now feels well damped, still avoiding the wallowy nature of some of its rivals, dealing with both small and large ruts in the road far better than ever before providing a soothing ride. Hurl the car into a corner and it rewards with well controlled body roll and lots of grip, the steering is also much weightier although still feeling lifeless most of the time There is also a lot less kickback through the column during mid corner bumps. The pedals also have a smooth action although the brakes require quite a prod to bring the 1,999 kg mass to a halt. The gear change is also better than ever before with an unobtrusive, well oiled action. Overall it’s a thoroughly competent steer although there is little fun to be had. Under the bonnet is the same 2.2 litre common-rail diesel engine as before producing a respectable 194 bhp and 311lb ft of torque fairly low down in the rev range between 1,800 and 2,500 rpm. It’s a smooth unit with plenty of low down grunt and thanks to additional soundproofing is impressively refined even when worked hard. Economy is also relatively good returning nearly 50 miles per gallon on a combined cycle with emissions of just 155g per kilometer which isn’t to be sniffed at. 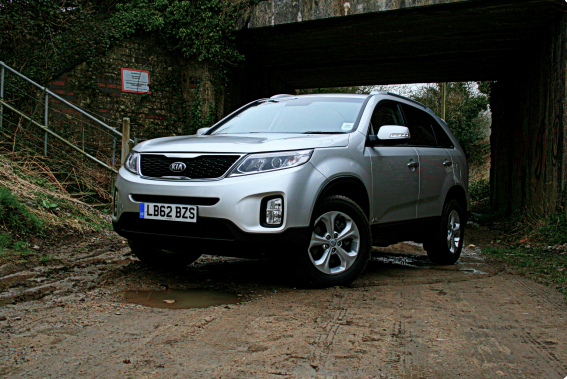 This entry was posted in 4X4 Car, Car Reviews, Cars, New Cars, News and Views and tagged full review, kia, kia sorento, New car review, review by Rob McSorley. Bookmark the permalink.